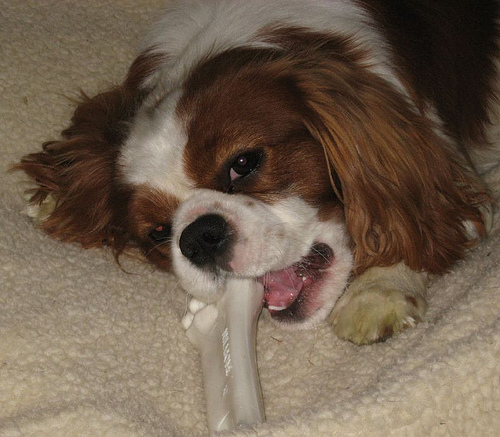 Those bone is too hard, it might make the teeth run out of alignment with puppy time, Remember always to supervise your dogs play and immediately remove any toys at the first sign of damage. aaaaaaaaaaaaa....wat is nylon bone ?? puppy loves to bite nylon bone. nylon bone is like toy to them? nylon bone is toy. open a nylon bone thread if you want. jooniez, i believe yours is nylon bone. Chew and eat gua.. LOL.. it is milk flavour de ma.. Your one is what kind? i also bought dino sleeky milk bone. he can kao tim it very fast! so far sometimes I will sushi poo something transparent and sticky, I think its the sleeky bone LOL.. cause if I do not feed that, she won't poo those thing. chew chew chew then shorter de lol.. so shud be eat oredi la..
last time chew no eat. I left a few sticks oni.. i thinking hoh, the big container one dunno same or not? LOL.. I once want to share with Sinv, the super big pack in plastic bag, but dunno reliable or not.. maybe we can share, cause really big pack. yenlu wrote: chew chew chew then shorter de lol.. so shud be eat oredi la..
instead of eat till habis he lick till smaller. so cute one, eat become smaller.. Cause i was thinking if same, then find the cheaper alternative..
share which? sleeky one or what? she mean that big pack is other brand. duno good or not. then i'm teling her sleeky got big pack also. then yenlu ask u which u want to share? ?the other brand or sleeky 1?